Fitzwilliam is committed to small-group teaching, the hallmark of our collegiate tradition. In 2012-13, our 466 undergraduates received over 20,000 hours of small-group teaching from 932 supervisors. College teaching lies at the heart of the Cambridge learning experience, but is costly. Although student fees have increased considerably, this has been more than offset by cuts in the University’s teaching grant from the Government. A Cambridge education actually costs around double the £9,000 fee, and the supervision system is a key factor in this. Despite the expense, we believe that small-group teaching represents value for money, being one of the most effective means of stimulating our students and preparing them for Tripos. Established in 2012, the Teaching Fund supports the College’s load, ensuring that our students continue to receive supervisions led by world-leading academics, and protecting the best that Cambridge, and Fitzwilliam, has to offer. Donations to the Fund are expended within a year or two of receipt, so our undergraduates benefit immediately from the support of donors. 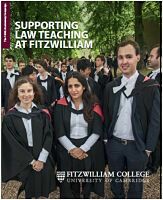 Find out how you can help Fitzwilliam build an endowed Law Teaching Fund of £1 million. Your contribution will help ensure that Fitzwilliam remains one of the top performing colleges for Law in Cambridge, offering opportunities to students from all backgrounds. This fund was established in memory of Norman Walters, Admissions Tutor and Director of Studies in English at Fitzwilliam House in the 1950s. The Fund provides much-needed support for a College Teaching Fellowship in English. The College aims to raise £1 million to complete the Fund, and we are almost half way to achieving that target. For more information about how you can support teaching at Fitzwilliam, or to make a donation, please contact the Development Office.